In our second edition of undervalued QBs heading into 2015, we take a look at a guy who has been no worse than ninth in total passing yards since becoming a starter in 2011 – Matthew Stafford. Stafford is $7,800 on FanDuel (15th highest at QB) and $7,000 on DraftKings (12th highest at QB). Granted Stafford dropped to ninth in passing last season after finishing no worse than third in his first three full seasons, Stafford still threw for a solid 4,257 yards. He also eclipsed the 20,000 career passing yard mark in just 71 games – an NFL record. So, why the dip in fantasy points from 278.9 (7th) in 2013 to 251.58 in 2014 (15th)? We can look at four factors. The first is simple. After throwing for 29 TDs in 2013, Stafford only tossed 22 in 2014. TD variance is a simple one to find as long as there aren’t too many changes within the team to suggest there should be a decrease. This quickly brings us to the second factor – the Lions had a new coaching staff last year with head coach Jim Caldwell taking over for Jim Schwartz and Joe Lombardi taking over for Scott Linehan at offensive coordinator. Usually, I wouldn’t like something like this, because it can mean a significant change in philosophy. However, the Lions actually threw the ball 59.62% of the time in 2013 (15th) compared to 62.41 % of the time in 2014 (7th). So, when Stafford finished seventh in QB fantasy points in 2013 and was 15th in pass play percentage, it was the exact opposite in 2014 with being 15th in QB fantasy points and seventh in pass play percentage. What makes this even more interesting is that the Lions finished 7-9 in 2013 and were 11-5 in 2014. Typically, when you’re losing games, you’re throwing the ball more frequently trying to play catch up. This showed the exact opposite in that the Lions were throwing the ball even more in 2014 to a more successful record. Again, we point to the TDs. But what makes us think that Stafford’s TDs will increase other than just calling it variance? 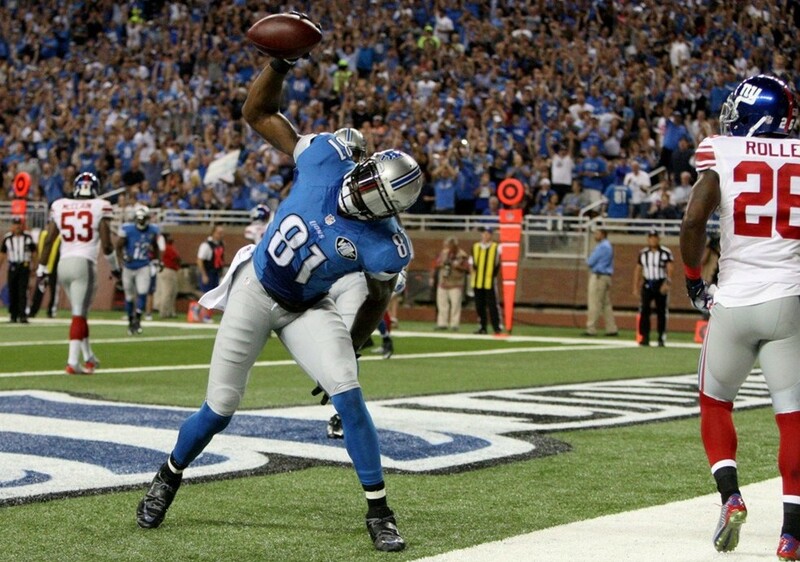 Here’s the third factor – Calvin Johnson’s injured knees. While Golden Tate was a fantastic addition for the Lions last year, Calvin has always been the go-to man for Stafford in the red zone. Calvin missed three games and was anything but healthy for at least another two (speculating a lot more) last season. Then, if we look at the red zone, Stafford was targeted a team-high 13 times, but he caught a fifth-best four receptions, all of which were for TDs. Again, Calvin is the man Stafford obviously goes to, and that’s because he gets targeted on slants, skinny posts, fades, you name it. 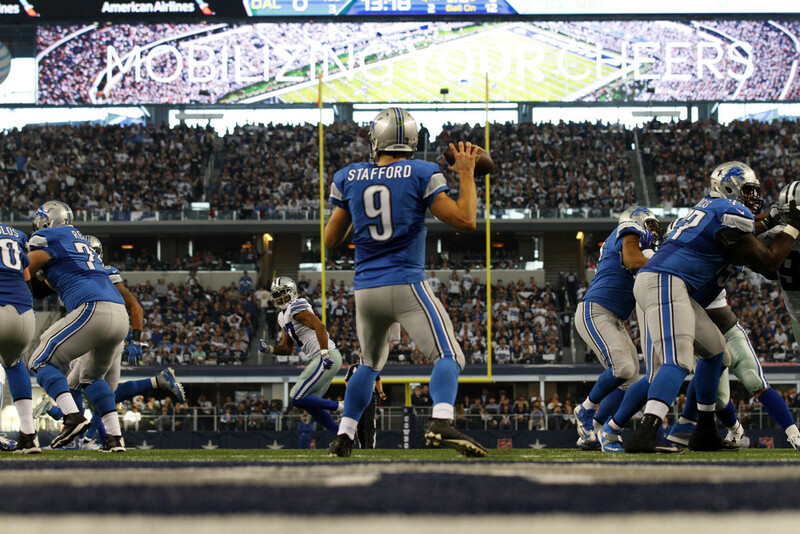 Calvin’s knees plagued him all of October and then some, which ultimately hurt Stafford’s fantasy production. Assuming we get the full version of Calvin again, which we should, Stafford’s TDs are even more likely to bounce back. Lastly, something that can certainly hurt a QBs performance is a drastic change in returning starters, particularly on the offensive line or by losing a go-to receiver. All of the Lions starters return on offense with the exception of running back Reggie Bush and fullback Jed Collins. Detroit rarely used a fullback, so we take a look at Bush, who did most of his damage in the PPR department. The Lions drafted Ameer Abdullah in the second round last season to replace Bush. Abdullah will be a great fantasy play in general with his rushing yards, PPR value, punt and kickoff returns. But what makes Abdullah great for Stafford is the PPR element and the fact that he can pass block. This isn’t an effort by the Lions to become a more balanced offense or be a run heavy team inside the red zone. Bell will still likely get those touches inside the five. Abdullah will get the same kind of action, or perhaps a little bit more than Bush. Abdullah’s role will be similar to Bush. At 5’9″ and 209 pounds, Abdullah has the great combination of power, speed and vision you want in a back, especially in the passing game. While this was McNeese State and some borderline optional tackling was happening, you get the point. His addition in the passing game will leave no drop off with the absence of Bush. To recap, Stafford finished 15th in fantasy points for QBs last season, is the 15th-most expensive QB on FanDuel and 12th-most expensive on DraftKings. To put this all in perspective, I don’t think we’ll see his 2011 numbers of 5,035 passing yards and 41 TDs. The Lions OL and rushing game was atrocious that season. However, we should see something similar to his 2013 numbers of 4,650 passing yards and 29 TDs. Throw that on top of the fact that Stafford is good for a QB sneak rushing TD here and there, Stafford should easily be a top 10 fantasy QB this year with a best-case scenario of top five.